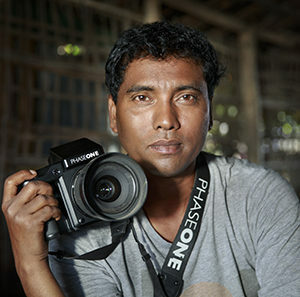 Tushar is recognized as one of the leading freelance documentary photographers in Bangladesh. Photography is his hobby, his passion, and his profession. Photography is his love, his life. His photography is the other name of his love and lust for life. Since 2000 he has been working as a full time professional photographer. After completed his graduation he has taken photography as profession. He regularly supplying imagery and giving service to a wide range of clients. Presently he is Secretary General of Bangladesh Photographic Society (BPS) and Managing Director of Photo Bangla photo agency. 01. Diploma in photography from Beg Art Institute of Photography. 02. Diploma in Photojournalism from Bangladesh Photojournalist Association. 03. Basic Course on Photography from Bangladesh Photographic Society. National Institute of Mass Communication. 05. Seven workshops on photographic different part. Ever since Tushar first began taking photography seriously, his images have been in demand commercially. Since 1998 his images have been published regularly in national newspapers and magazines as well as in books, greeting cards, and calendars. Over this time he has worked for many large and prestigious organizations, supplying imagery and undertaking commissions for companies including BBC, National Geographic, Helvetas, Telenor, renowned international photo agencies, Grameen phone, Robi, Ministry of foreign affairs of Bangladesh, ministry of environment of Bangladesh, NGOs, Banks and others organizations. His images published more than 500 books, calendars and magazines. His images published Forbes magazine, Euromoney magazine, BBC, National Geographic, The Atlantic, the Washington Post, USA Today, NPR, Huffington Post, The Guardian, L’actualite, Forbes Russia, Helvetas, Financial Times and renowned international photo agencies & newspapers. ** His photographs exhibited at different international photo exhibition in Asia, Europe &USA. ** He has owned more than fifty photographic awards from different Club, National & International Photo competition. >> Gold Medal and Silver Medal in Travel Category from Olympic Photo Circuit, Greece, 2014. >> FIAP Silver Medal, 2nd Prize (Travel category) from Emirates Photography Competition 2013. >> Award-2008, 2010, 2011,2013 organized by the Daily Star, Bangladesh. >> Organized by UNESCO & HPA, China. 2009 & 2011. >> CGAP Micro Finance photo award 2012 organized World Bank USA. >> People & Planet photo award 2011 Australia. >> Best photographer Award by Television Reporter association of Bangladesh(TRAB) -2002. >> He has Achieved LBPS & ABPS Professional Degree in Photography from Bangladesh photographic Society. >> Life member of International Freelance Photographic Organization(IFPO) USA.